Canada were the first team to qualify for the semi-finals with a 9-3 win over Sweden in just six ends. They had last stone and used it to score three points in the first end. They then increased their lead with a steal of one point in the second end. Sweden could only score one point in the third end and then a further score of two points by Canada gave them a 6-1 lead at the fourth end break. Sweden did score two points in the fifth end, but when Canadian skip Alan O'Leary drew his second stone of the sixth end into the house to score three points, the Swedes conceded with the score at 9-3. USA faced Ireland in the quarter-final session and for the Irish, this was a third game of the day following their 7-6 wins over the Czech Republic in a tie-breaker then another 7-6 win over Australia in the qualification game. This took its toll, with Ireland's lead David Hume retiring exhausted after the halfway point, leaving his three team-mates to battle on. Before this, the USA had built a 4-1 lead after four ends and a further score of two points in the sixth end, to make the score 6-2. piled the pressure on Ireland. They could only score one point in the seventh end and then ran out of stones. 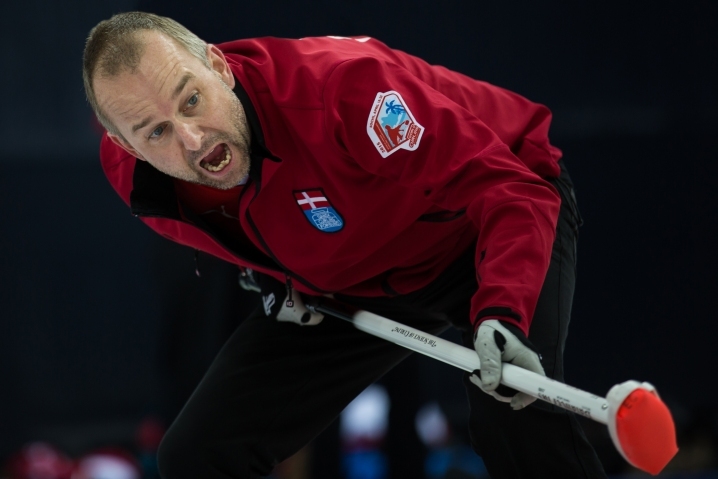 Denmark faced Scotland and the Scots took an early lead, stealing single points in both of the first two ends. However Denmark scored two points in the third end when Scottish skip Gordon Muirhead was heavy with his draw. In the fourth end, Scotland scored one point and took a 3-2 lead into the fourth end break. The score was level at 4-4 after seven ends, and when the Scots could not remove a Danish stone sitting in the middle of a cluster in the eighth end the Danes won, by 5-4 without their fourth player Poul-Erik Nielsen having to play his last stone. New Zealand faced Switzerland in the fourth quarter-final and this game swung back and forth throughout. In the eighth end, Switzerland's skip Stefan Signer scored the one point needed to force an extra end. In that end, the New Zealanders stoutly guarded a stone that they got into shot position early and gained their reward when Switzerland could not remove it, giving New Zealand a 5-4 victory. In the semi-finals, the New Zealanders will face USA, while Canada play Denmark.